Get your camera ready for this one, and don't forget your swim suit, hiking shoes, and fishing pole. Just south of Flagstaff, Arizona State Route 89A descends a breathtaking series of switchbacks into a scenic, smaller cousin of the Grand Canyon. Known for colorful rocks and unique formations, Oak Creek Canyon is famous the world around for its spectacular scenery. Before you drive into the canyon you'll want to stop at Oak Creek Canyon Vista. Here you can get a bird's eye view of what awaits you down the road and, at the same time, shop for Native American jewelry and other craft items from the local Native American artists who set up displays along the pathways. Once you've snaked your way down the switchbacks, SR 89A winds a lazy course down the length of Oak Creek Canyon. It's actually possible to enjoy the scenery here without leaving your car, but most people choose to get to know these crimson cliffs and crystal pools on a more personal basis. For that purpose there are plenty of overlooks, picnic areas, swimming holes and hiking trails all along the drive. At Midgely Bridge, there's a vista point with an especially unforgettable backdrop where you'll want to stop and use that wide-angle lens. As you leave Oak Creek Canyon and continue past Sedona through Red Rock Country, an observer with a sharp eye will recognize familiar shapes among the natural sculptures that form the horizon. Keep an eye out for Steam Boat Rock, Courthouse Butte, Bell Rock and more. 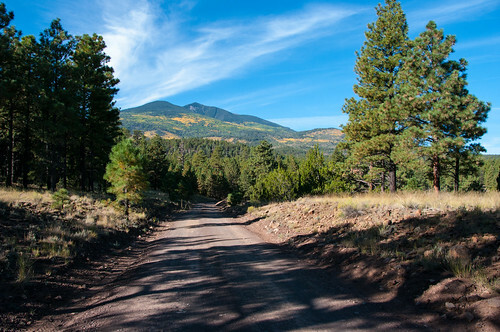 You can continue down this scenic route to Interstate 17 and then back to Flagstaff, or you may want to turn around and do it all over again. If you're driving a high clearance vehicle, another way to complete the loop is to return to I-17 via the unpaved, rocky Schnebly Hill Road rather than State Route 179. The vistas along this rocky but rewarding backroad are as good, if not better, than any along the rest of the drive. A high clearance vehicle is highly recommended for this route. In winter months, the upper part of Schnebly Hill Road is closed above Schnebly Hill Vista (near the top of the ascent up Bear Wallow Canyon), and the unpaved portion may be completely closed during wet weather conditions. Check Road Status before attempting this alternative route. Road Condition: All roads (except alternative route up Schebly Hill Road) are paved and plowed, but may be slippery after a winter storm. Driving Time: 2.5 hours or all day. This drive takes you all the way around Arizona's highest mountain, winding through a land of pine forests and aspen groves, open prairies and rustic homesteads. Anytime is a good time to enjoy this drive, although the roads are closed through much of the winter (you might want to ski or snowmobile it then). In the spring, wildflowers follow the retreating snow up the mountain. They color the meadows and decorate the forests reaching a climax just as summer comes to a close. Autumn then turns the mountain to gold, filling forest roads and trails with visitors come to enjoy the colorful display. There are a number of places along this route where you can stop to take a hike, enjoy a lunch or even set up a primitive camp. That way you can take more than one day to do this drive or combine it with one or more of the other scenic drives in the vicinity of the San Francisco Peaks. Elden Pueblo is the site of an ancient Sinagua (Sin ah’ wa) village, inhabited from about A.D. 1070 to 1275. The site is unique for a variety of reasons. Most importantly, it makes archaeology and the study of ancient peoples accessible to the public. Since 1978, professional archaeologists have supervised members of the public in excavations, archaeological research techniques and artifact analysis through a variety of public and school programs. Conveniently located on U.S. Highway 89 north, Elden Pueblo is thought to have been part of a major trading system. This is evidenced by discoveries of trade items, such as macaw skeletons from as far south as Mexico, to shell jewelry from the California Coast. Important discoveries recently uncovered at Elden Pueblo suggest that the Sunset Crater volcano may have erupted over a much longer period of time than previously thought. The Arizona Natural History Association sponsors the Elden Pueblo Archaeology Project with the Coconino National Forest to provide opportunities for people to learn about and become involved in the science of archaeology. Annual programs include several Public Archaeology Days, in which the public can participate in site tours, actual excavation, artifact washing and analysis, and try their hand at using ancient hunting weapons. The August Public Day features a Primitive Technology Expo and the last Public Day of the year takes place in the fall as part of the annual Flagstaff Festival of Science. Elden Pueblo is available for school programs and groups of up to thirty people. Educational programs are correlated to the Arizona State Standards, grades 4-7 in Social Science and Science. Custom programs are available, from 1-2 hours tours, to day-long excavations, or multiple-day programs. Elden Pueblo hosts the Arizona Archaeology Society’s summer field school, where avocational archaeologists receive training in various archaeological skills, such as excavation, stabilization, mapping, and laboratory techniques. There are also summer archaeology camps for students, from third grade and up. Learn more about Elden Pueblo, including a history of the Sinagua, programs, a glossary, frequently asked questions, and a list of references.